Read about the Cancer, Culture and Community colloquium events here. 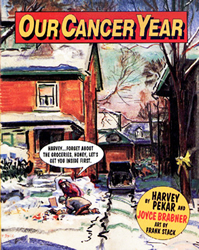 Harvey Pekar, author of the comic book series “American Splendor,” and his wife Joyce Brabner collaborated in 1994 with illustrator Frank Stack to chronicle the true account of their lives in a year spent battling Harvey’s cancer in the graphic novel “Our Cancer Year.” Purdue Galleries is presenting an exhibit of the illustrations of Frank Stack from this touching account, in collaboration with the “Cancer, Culture and Community” series presented by Purdue Oncological Sciences Center in Discovery Park and the College of Liberal Arts. Brabner and Stack will be featured presenters at this year’s CCC events and will present workshops and class discussions on campus and in the Lafayette-West Lafayette community.